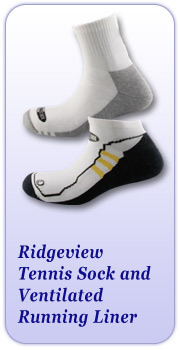 Ridgeview Ltd. was established in 1985 as a sport sock manufacturer, located in the Monavalley Industrial Estate, Tralee, Co Kerry, Ireland. In November 2000 the management team bought the company from its American owner Ridgeview Inc. The management buyout of the Irish operations was relatively easy from an operational view point. Throughout its operational existence as a subsidiary of Ridgeview Inc. the Irish operation was maintained as a separate business with separate management, customers and manufacturing facilities. Ridgeview has undergone a major re-structuring over the last 6 years, in order to meet the demands of our customers and competition from lower labour cost countries. This has resulted in a phased downsizing of the Irish manufacturing and an improved infrastructure of sourced manufacturing. In 2004 we moved our machinery to Portugal and Lithuania and in 2007 decided to move all our machinery and concentrate all our production in Portugal. Our joint venture with MFA saw the building of a purpose built newly expanded site and the acquisition of a well established, high quality finishing plant. Competitive pricing in view of the infrastructure required to achieve the above.